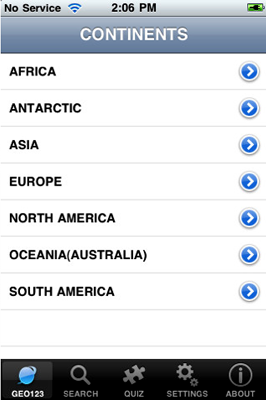 GEO123 is an iPhone app developed for kids for learning Geographical and Political informations of the world. The main goal of the app is to provide mobility information to kids about the world whenever they need. 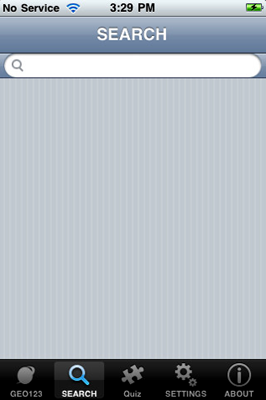 The app contains search and quiz features. By using the advance search technology kids can find gegraphical information. The app also provides the an intelligent quiz feature by which kids can test their knowledge about the Geography of the world. the quiz is customizable according to kids need and knowldege. 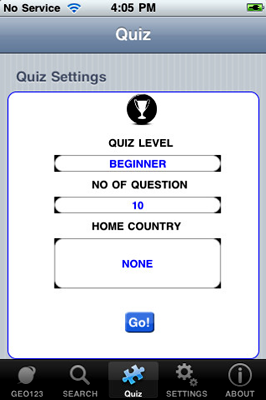 The quiz provide three level of playing quiz : Beginner,intermediate and professional. In beginner level kids have a choice of question been put up from their home country or selected country. It has also customizable no. of question play. The quiz stores the score obtained in various level's. The advance search feature of GEO123 gives a faster search speed to the user to find particular information according to the keyword specified. 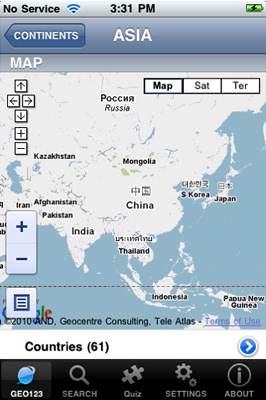 the app also uses the Google Map for showing continent, country and capital maps. This display search continents in map, so kids can learn easily. Quiz panel shows quiz level and no of question for kids. Setting panel allows kids to set their profile for defualt such as no of question and quiz level. Search panel allows kids to search contients and other. User can view contienents list and view map by chossing them.